Countries within the Euro zone do not enforce border controls within Europe and instead focus their efforts on external borders. This Schengen Area comprises of 26 European countries that have removed passport controls and effectively any border controls. The attacks in Paris and the subsequent arrests in France, Belgium and Germany have raised some concerns on whether the Schengen agreement has enhanced or detracted from security within Europe. The European Union establishment sees the rise of this discord amongst the citizens as a threat to the long standing plans of the common union. They point out many of the security benefits that have come about with this agreement and push to further enhance powers of the EU security and government organizations. The individual countries and their citizens may not agree, but they are party to this accord – with or without the threats from terrorism. 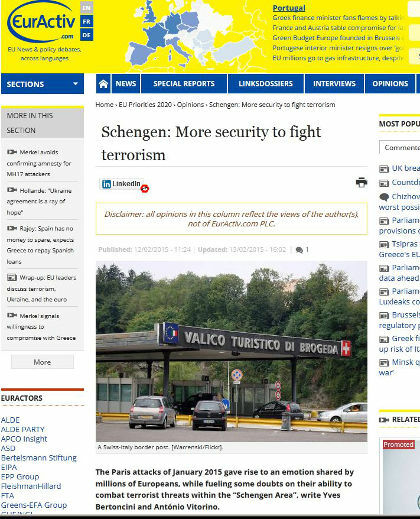 Can Europe combat terrorists within the “Schengen Area”? “In conclusion, European cooperation with third countries in which terrorists are likely to travel must be improved – for example Turkey and North African countries – and also with the USA. A globalised movement of police and judicial cooperation must be promoted to increase Europeans’ safety, against a movement of unrealistic and ineffective focus on national borders. The terror attacks in Paris seem to have woken up law enforcement authorities in several European countries as Islamic terrorists have been arrested in Belgium, France and Germany. 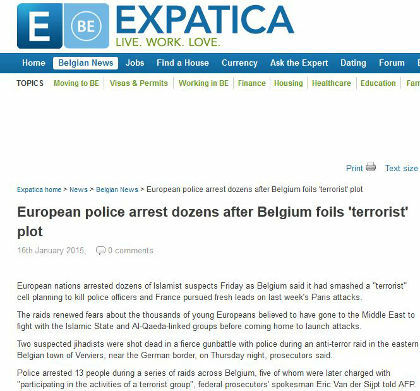 The epicenter of the recent counter terrorism action was Belgium where two terrorists were killed in raids as security services moved in believing that terrorist attacks on Belgian police and citizens were imminent. Belgian prosecutors are saying that terrorists planned to conduct multiple attacks against police officers both on the streets and also attacks on some police stations. Many of those arrested are believed to have previously traveled to fight in Syria and were under surveillance. Though it is unclear whether these perpetrators had any direct relations with the Paris terrorists, this type of jihadi terrorism in Europe has long been feared by security experts. Previous arguments about the fractured European society, immigration, muslim no-go-zones, ghettoization of many European cities, radical preaching, etc., which were and are still considered non-politically correct arguments, are again being brought to light. The copycat effect from Paris is likely also in play as those with similar ideologies and plans, would look to maximize the effect of the terror, on the populace. Police found four Kalashnikov rifles, explosives, ammunition and communications equipment during the raids, along with police uniforms. As was the case in Paris, the discovery and use of military grade weapons may come as a shock to many who are told that guns are tightly controlled in Europe. This may be true for the average citizen, but criminals (and by that extension terrorists) have never had problems acquiring deadly weapons.